The 34th TOP500 List released November 17th in Portland, Oregon at the SC09 Conference. A PDF version of the TOP500 Report distributed during SC09 can be found here. What to do with an old nuclear silo? 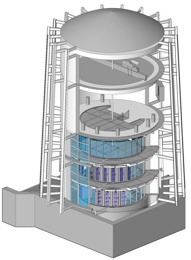 Question: What to do with a 36 feet wide by 65 feet high nuclear grade silo with 2 feet thick concrete walls ? A supercomputing center in Quebec has transformed a huge concrete silo into the CLUMEQ Colossus, a data center filled with HPC clusters. The silo, which is 65 feet high with two-foot thick concrete walls, previously housed a Van de Graaf accelerator dating to the 1960s. It was redesigned to house three floors of server cabinets, arranged so cold air can flow from the outside of the facility through the racks and return via an interior 'hot core'. The construction and operation of the unique facility are detailed in a presentation from CLUMEQ.